In this article, we present results of the effect of designed compost extracts use on managing weed biomass, soil physical properties, and yield in three crops grown in fall 2016. Organic farmers consider weeds their number one problem in crop production and are constantly on the lookout for practical technologies that reduce competition of weeds with crop plants. Weeds compete with crop seeds for water, space, light and nutrients at a faster rate than many crop plants, especially in the first 20-30 days of crop growth and have a far greater impact on crop yields than later in the season. Mechanical cultivation and hand weeding are the most widely used weed control methods in organic vegetable production systems. Hand weeding is labor intensive and time consuming. Frequent soil cultivation decreases soil health, increases fuel and labor costs, brings buried weed seeds to the soil surface where they are more likely to germinate and compete with crop plants; and reduces yields and growers’ profits. Results from proof-of-concept bench-top experimental trials in 2014 showed that applications of chemically and microbially-designed (CMD) compost extracts low in nitrate levels and high in number of nematodes-to-protozoa reduced lambsquarter seed germination by 32% as compared to those without extracts. Other trials showed that pigweed seed germination was suppressed by 20% when applied compost extracts had lower nematode-to-protozoa ratios. 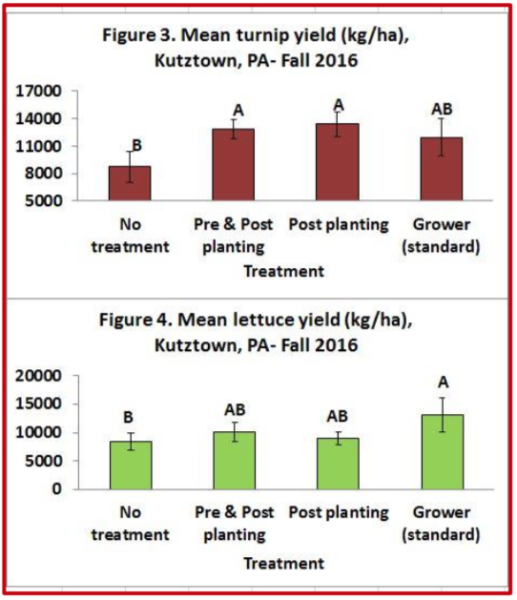 The effectiveness of CMD-CE for weed control has been tested and compared to growers’ management practices on a large scale at Quiet Creek farm, owned by Aimee and John Good, Kutztown, PA in spring and fall season. 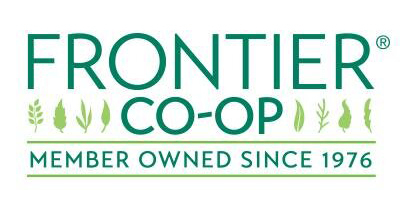 The overarching goal of this project was to find alternative methods for organic weed management that are environmentally and economically feasible and deemed practical and available to organic growers. The specific objective of this project is to demonstrate the effectiveness of using CMD-compost extracts to manage weeds, and improve crop yields, soil health, and management costs. In a randomized complete block design with four replications, four treatments were tested: 1) post-planting CMD-CE application, 2) pre- and post-planting CMD-CE, 3) in-season cultivation or hand-hoeing (standard), and 4) no cultivation or compost application (no treatment). Soil, weed pressure, and crop yields were evaluated. Aimee and John Good participated in soil cultivation, preparation of beds and in-season cultivation or hand-hoeing (for Grower’s standard treatment). Three crops were selected for the fall season field experimental study: Cabbage ‘Melissa’; Turnip ‘Hakurei’; and Lettuce ‘Jericho’. Dr. Zinati prepared compost with feedstock made of 30% “browns”, 50% “greens”, and 20% “high N” to evaluate suppression of weeds. Straw and wood chips represent the browns, whereas vegetable and leaf wastes represent the greens. The high N is supplied from leguminous sources such as fava beans. Compost extracts were prepared 24 hours before application. They were prepared at 1:3 dilution (V:V) using deionized water and were screened before being applied using a backpack sprayer. Cabbage seedlings were transplanted into two-row beds spaced 76 cm between rows and 46 cm spacing within rows on July 13, 2016. Cabbage seedlings were covered with row covers immediately after planting. The standard practice of weeding is mechanical cultivation after the removal of row covers. Mechanical cultivation included the flex-tine weeder and duckfoot sweeps. Turnip seeds ‘Hakurei’ were directly seeded into 3-row beds, spaced 38 cm between rows with continuous bands of turnip seeds within the row using the Cole planter hand seeder on August 18, of 2016. After seeding, beds are covered with row covers. Hand-hoeing was the weeding method for the turnip crop. Lettuce seedlings were transplanted onto three-row beds with 38 cm centers between rows on August 18, 2016. Compost extracts were applied on July 11, 2016 before planting and on July 13, August 3, and 24, 2016 as post-planting. For lettuce and turnip, compost extracts were applied on August 17 before planting and on August 19 for both crops, and on September 16, 2016 for lettuce only. For turnip crop weed biomass was 43% lower when compost extract was applied as a post-planting treatment and 38% lower when applied pre- and post- planting compared to no treatment while the grower standard treatment (hand- hoeing) reduced weed biomass by 11% only (Figure 1). The weeds were diverse and mainly included Pennsylvania smart weed, galinsoga, purslane, and wild radish. In no treatment plots pigweed and galinsoga were the major weeds. All treatments had grass weeds. Weed biomass in cabbage plots that received compost extracts was not significantly different from those in grower’s standard treatment (in-season cultivation). 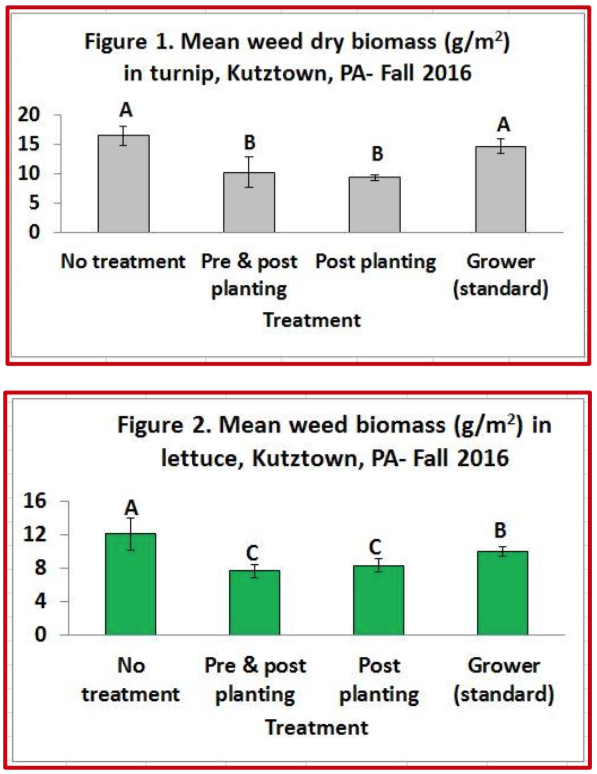 In lettuce, the use of compost extracts reduced weed biomass by 19% and 34%, respectively, compared to grower’s treatment and no treatment (Figure 2). Major broadleaf weeds included mustard, galinsoga, and wild radish. Similarly to turnip and cabbage, grasses were lower in grower’s treatment due to hoeing. Thus, the use of CMD compost extracts can be used as an alternative approach to mechanical cultivation and hand- hoeing to manage weeds. Mean turnip yield was significantly greater in treatments that received compost extracts than no treatment and not different from grower treatment (Figure 3). 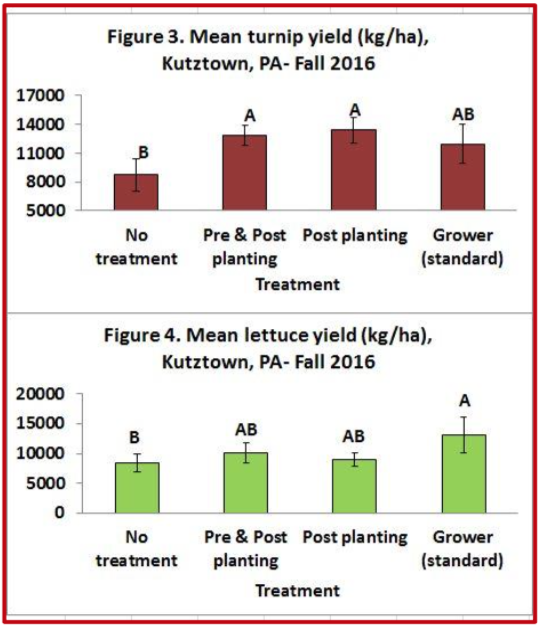 Lettuce yield was significantly greater in grower treatment than in no treatment and not different from those treated with compost extract (Figure 4). There was no significant difference in either number of cabbage heads or yield per treatment. Cabbage heads ranged between 30,000 and 35,000 heads per hectare and yield ranged between 11,500 to 13,800 kg per ha. Soil bulk density did not vary with treatments but it was lower in lettuce (0.8g/cm3) compared to cabbage (1.07 g/cm3). Penetrometer readings were greater in soils that received compost extract (27.58 cm and 28.75 cm; post-planting and pre- and post-planting, respectively) compared to grower treatment (20.04 cm) in cabbage beds. Chemically and biologically designed compost extracts when used at 1:3 dilutions (compost: water ratio) can be effective in managing weeds and used as an alternative approach to hand- hoeing or mechanical cultivation as well as reducing soil compaction and producing comparable crop yields to the standard grower’s method. The approach of using CMD compost extract can benefit all organic vegetable growers including new and young generation growers who are limited with labor assistance and equipment. This material is based upon work supported by a Northeast SARE Partnership Grant, under Grant Agreement Number ONE 16-278, and by Organic Farming Research Foundation (OFRF). Dr. Gladis Zinati, Ph.D. is the associate scientist and director of the Vegetable Systems Trial at Rodale Institute. For more updates on Rodale Institute’s research and programming, follow us on Facebook, Instagram, and Twitter.